The Angara was a new all-Russian heavy launch vehicle designed in the 1990's to replace the Zenit (which was built by a Ukrainian company) and Proton (which had launch pads only on Kazakh territory). The booster was sized for rail transport of modular manufactured components to cosmodromes at Plesetsk and Svobodniy. The design featured a single modular core that could be clustered for large payloads or used as a first stage with a variety of existing upper stages. Lack of financing led to a very protracted development. A prototype was financed by the Korean government as the first stage of their KSR launch vehicle, and a full-up Russian Angara finally was launched in 2015. 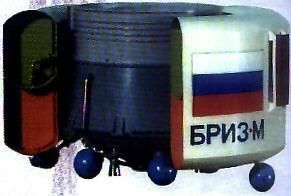 The booster would use engines developed for the Zenit. The first Angara design by Khrunichev featured a unique parallel fuel tank configuration in both first and second stages. This concept beat two competing NPO Energia designs: the Energia-M and a 'clean sheet' in-line concept. However the second stage was initially subcontracted to Energia by Khrunichev. By 1999 the design had evolved to a very different scheme similar to the Evolved Expendable Launch Vehicles being developed for the US Air Force. The new design took into account commercial considerations and concentrated on development of a single modular core that could be clustered for large payloads and used as a first stage with a variety of existing upper stages. This core was designated the Universal Rocket Module (URM). Production drawings were released in February 1999 and the cold flow test article was flown to the Paris Air Show and exhibited in the summer of 1999. By that time a total of 19 possible variants of the launch vehicle had been studied. The plan at that time was for the construction of three ground-test articles to be followed by three test flights beginning by the end of 2000 and completed by June 2001. First launches would be from the former Zenit pad at Plesetsk. As of 2008 funding problems continued, and no flight tests had been conducted. Instead South Korea had provided funds to develop a version of the Angara as its KSR booster. The Russian Angara finally flew in 2015. Angara 1.1 Russian orbital launch vehicle. The initial flight version would be the Angara 1.1, featuring a single URM core module with the existing Briz upper stage. Payload would be 2.0 metric tons to a 200 km / 63 deg orbit). Other vehicle variants were numbered according to the number of URM's. Angara 4A Russian orbital launch vehicle. The Angara 4A had the same configuration as the Angara 1.2 but with a winged, recoverable URM. The booster would have 158 metric tons lift-off mass, and could place a 2.7 metric ton payload into a 200 km / 63 deg orbit). The winged URM would have two jet engines and fly back to the Mirniy airfield at Plesetsk for recovery. One problem was that some abort profiles would require overflight of Norway. First flight of this version was predicted for 2003 in 1998. Angara-1.2PP Russian orbital launch vehicle. 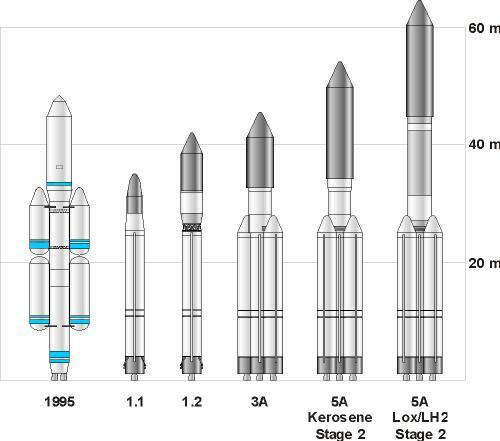 First planned upgrade of Angara, the 1.2 version would use a new Block I LOx/kerosene upper stage. Payload would be 3.7 metric tons to a 200 km / 63 deg orbit. Angara 5A Russian orbital launch vehicle. 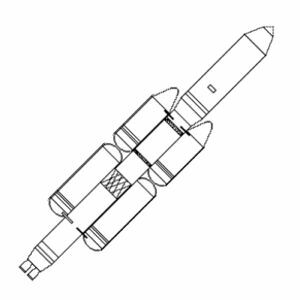 The Angara 5A was a proposed variant of the modular launch vehicle that would use four universal rocket modules (URM's) as boosters surrounding one URM in the core, with a LOx/LH2 upper stage. It could put 5.0 metric tons into geosynchronous orbit, or 8.0 metric tons into geosynchronous transfer orbit. Angara Orel Russian orbital launch vehicle. The Orel, consisted of the Angara 3I plus an MKK spaceplane, similar to the MAKS. This would have a 431 metric ton gross lift-off mass, with the spacecraft weighing 13.5 metric tons including a 4.2 metric ton payload. This could be an eventual replacement of the Soyuz spacecraft for ferry of crews to space stations. Naro-1 In 2005 it was announced that the KSLV-I would not fly until 2007. It was now a completely different vehicle, consisting of a first stage derived from the Russian Angara launch vehicle, and a solid propellant second stage of South Korean manufacture. First launch 2009.08.25. KSLV-II South Korean launch vehicle, originally scheduled for first flight by 2010. Evidently it would have consisted of a Russian Angara first stage and a South Korean liquid-propellant second stage. In August 2006 it was reported in the Korean press that this launcher configuration was cancelled. KSLV-III South Korean launch vehicle, consisting of a downgraded Russian Angara first stage, a South Korean liquid propellant second stage, and a South Korean solid propellant apogee kick motor. Scheduled for first flight by 2015. In August 2006 the Korean press reported that the first and second stages would both be Angara-UM modules� how this configuration would work (stacked versus parallel) was unclear. Angara-A5 Briz-M Russian orbital launch vehicle variant of Angara with Briz-M upper stage. Angara-A5 Blok-DM-03 Russian orbital launch vehicle variant of Angara with Block-DM upper stage. Family: orbital launch vehicle. Country: Russia. Engines: RD-171, RD-0120M, RD-134R, RD-146, RD-191, RD-191M, 17D58E, S5.98M. Spacecraft: STSat, Kliper. Agency: Chelomei bureau. Bibliography: 220, 42, 455. 1994 August 30 - . LV Family: Angara. Launch Vehicle: Angara 1.1. Work starts on Angara launch vehicle - . Nation: Russia. Ministry of Defence authorizes work to start on Angara launch vehicle. Angara will replace Zenit (built in Ukraine) and Proton as future Russian medium launch vehicle, launched from Plesetsk and Svobodny..
1999 June 12 - . LV Family: Angara. Launch Vehicle: Angara 1.1. Angara cold flow test article exhibited at the Paris Air Show - . Nation: Russia. 2009 August 25 - . 08:00 GMT - . Launch Site: Goheung. LV Family: Angara. Launch Vehicle: Naro-1. FAILURE: First and second stages operated correctly, but half of payload fairing failed to separate. Extra mass prevented the second stage and payload from reaching orbital velocity, and the satellite reentered over New Guinea..
STSAT-2 - . Mass: 100 kg (220 lb). Nation: Korea South. Agency: KARI. Class: Technology. Type: Technology satellite. Spacecraft: STSAT. 2010 June 10 - . 18:01 GMT - . Launch Site: Goheung. LV Family: Angara. Launch Vehicle: Naro-1. FAILURE: First stage failure..
STSAT-2B - . Mass: 99 kg (218 lb). Nation: Korea South. Agency: KARI. Spacecraft: STSAT. Science and Technology Satellite with Lyman-alpha imaging solar telescope and laser altimeter..
2013 January 30 - . 07:00 GMT - . Launch Site: Goheung. LV Family: Angara. Launch Vehicle: Naro-1. STSat-2C - . Mass: 90 kg (198 lb). Nation: Korea South. Class: Earth. Type: Geodetic satellite. Spacecraft: STSat. USAF Sat Cat: 39068 . COSPAR: 2013-003A. Apogee: 1,464 km (909 mi). Perigee: 295 km (183 mi). Inclination: 80.27 deg. Period: 102.56 min. First indigenously-launched South Korean satellite; first successful launch of KSLV-III launch vehicle..
2014 July 9 - . 12:00 GMT - . Launch Site: Plesetsk. Launch Complex: Plesetsk LC35/1. LV Family: Angara. Launch Vehicle: Angara-1.2PP. Maketa - . Nation: Russia. Agency: KHRU. Apogee: 189 km (117 mi). Dummy satellite - . Nation: Russia. Apogee: 188 km (116 mi). Test flight..
2014 December 23 - . 05:57 GMT - . Launch Site: Plesetsk. Launch Complex: Plesetsk. LV Family: Angara. Launch Vehicle: Angara 5A. IPM - . Nation: Russia. Class: Technology. Type: Re-entry test vehicle. USAF Sat Cat: 40355 . COSPAR: 2014-085A. Apogee: 39,083 km (24,285 mi). Perigee: 36,163 km (22,470 mi). Inclination: 0.91 deg. Period: 1,530.92 min. First launch of the Angara-A5 booster, composed of five standard URM-1 modules and a Briz-M upper stage. Four URM-1's, clustered around a URM-1 in the core, formed the first stage. The core URM-1 was the second stage. The four first stage URM-1's separated at 06:01 GMT at an altitude of 82 km; the core URM-1 shut down and separated at 06:03 GMT at an altitude of 148 km, reentering downrange near Tomsk. The nose fairing was jettisoned 10 seconds later. The third stage was a URM-2, powered by the RD-0124A engine; it reached a marginally suborbital trajectory and, after separating from the upper composite section, reentered in the Philippine Sea at a range of 2320 km from the launch site. Meanwhile, the fourth stage, a standard Briz-M (S/N 88801) propelled the stack into a 250 km, 63 deg parking orbit with a burn starting at 06:11 GMT. After coasting to the equator, two perigee burns at 07:03 and 09:26 GMT boosted the apogee to 5,000 km and then 35,800 km, while reducing inclination to 60.6 deg. The Briz-M's additional propellant tank (DTB), now empty, was jettisoned into a 433 km x 35,808 km x 60.6 deg orbit. The payload on this flight was a dummy satellite called the IPM. The stack coasted to apogee and at 14:44 GMT, began the fourth burn to enter circular geosynchronous orbit. At 14:57 GMT the Briz sent a simulated separation command, but the payload remained attached to the stage as intended. After a few more hours, two burns of the Briz stage's SOZ auxiliary engines moved the stack to a graveyard orbit a few hundred kilometers above GEO. This was the first GEO mission ever launched from Plesetsk. 2018 November 28 - . 07:00 GMT - . Launch Site: Naro. LV Family: Angara. Launch Vehicle: KSLV-II. TLV - . Nation: Korea South. Apogee: 209 km (129 mi). R&D mission. Impacted near Jeju.